-Trybooking will be open until 4pm - remaining tickets will be available at the door. Please be aware that the Aleksandr Tsiboulski concert has limited seating and ticket sales at the door will be subject to availability. A festival inspired by the setting of the sun with spanish-inspired food, drinks and music. Puesta Del Sol is back in 2019 with La Rumba performing in the Grounds! 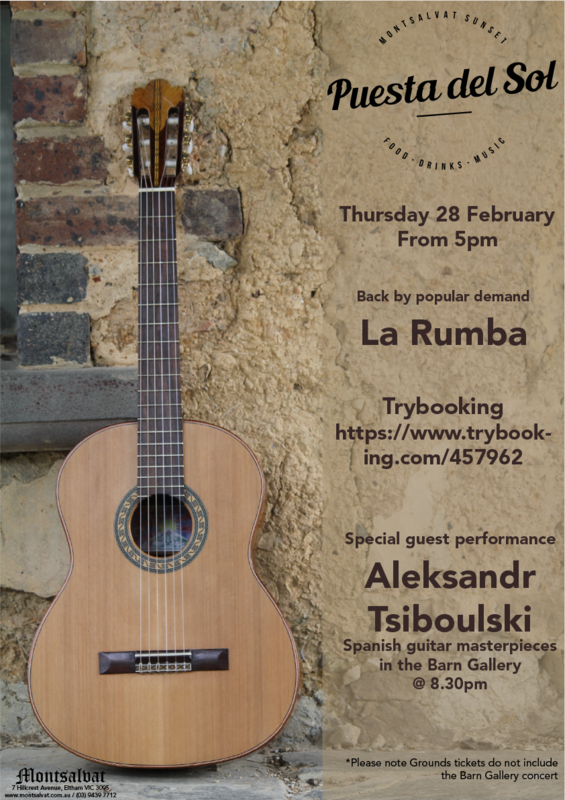 This year we are also offering a Barn Gallery Concert by international award winning maestro Aleksandr Tsiboulski! ! Be sure to add this concert onto your Puesta ticket selection when booking! Experience the intimacy and passion of the Spanish guitar in a concert of masterpieces played by international award-winning maestro Aleksandr Tsiboulski. Featuring music by Isaac Albeniz, Enrique Granados and Francisco Tárrega. Tickets are non-refundable. This event will go ahead regardless of weather.